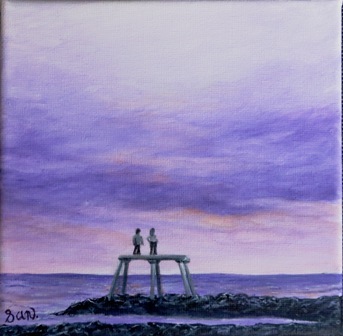 A lovely addition to my Mini Art Series, showing the famous, Newbiggin Bay Couple, as they stand gazing out to see, watching over the bay. A well known landmark for locals and visitors and a very popular sight. Painted in acrylic, signed, and varnished for a profession finish, with a natural wood box frame. It measures 7.75" square (19cm), making it small enough to fit into any home, whether large or small, but effective enough to be noticed by all. This would make a great gift for a friend or family member, or even a treat for yourself.